The Grafton Peace Pagoda is one of 80 peace pagodas worldwide, but only two in the U.S. (the other one is actually pretty nearby in Massachusetts). There are two buildings on the Grafton site --- the peace pagoda itself and a temple that is the home of Jun Yasuda, a Buddhist nun. Prayer services are conducted twice each day, around sunrise and sunset, and those who partake must remove their shoes and sit on a small rug. I was once lucky enough to accidentally stumble upon a prayer service and it was unlike anything I've ever participated in. I was even given a small drum to play. I'm not the most spiritual person, but it really did leave me with a feeling of calm. Jun Yasuda is a pretty interesting person. She belongs to the Nipponzan Myohoji order. Back in 1978, she walked from San Francisco to Washington, D.C. with Native Americans as part of the "longest walk," a coordinated peace movement. And since then, she's walked cross-country several time in the name of peace. Yasuda, was born in Japan. She discovered Buddhism in her mid-20s, while traveling through India after a divorce. Eventually she met Nichidatsu Fujii, the founder of Nipponzan Myohoji, in Sri Lanka. That meeting led to her involvement with what was called "the Longest Walk," which was aimed at promoting and garnering rights for America's indigenous people. In 1983, she was offered a parcel of land in Grafton, N.Y. and two years later, work got underway on a monument for peace. The Grafton Peace Pagoda was dedicated in 1993 and it's been attracting visitors from around the world ever since. Yasuda is still participating in demonstrations and walks for peace, including a commemoration of the 64th anniversary of the Hiroshima bombings held just last week. There's also an annual celebration of Ghandi's birthday held there each October and annual Sept. 11 walk. Visitors are welcome to check out the pagoda, partake in the services or wander the peaceful gardens. The feeling of calm is definitely true. It's a beautiful place to help empty your mind. I've been there! It's amazing. I would love to go back during the spring or summer (I went in mid-november). 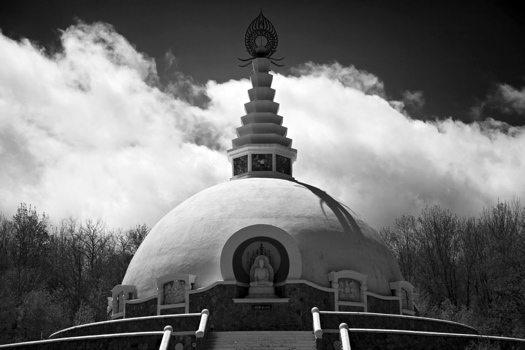 Thank you for featuring one of Grafton's truest treasures, The Peace Pagoda. I grew up in Grafton and recently watched the video my father made at the dedication ceremony that was held almost 20 years ago! I remember many things about that day but mainly the calm and omnipresent peace that was felt by those in attendance. Not only is it an interesting place to visit but economically and enviromentally beneficial. Thank you for reminding me how much I love my hometown and the treasures in it. Mike G and I got married at the Peace Pagoda last June. Truly has a special place in our hearts. Also, Jun Son is spiritual warrior like none other. Also, while not technically a Pagoda yet, there is a third Nipponzan "Peace Pagoda" and temple still under construction in the Smokey Mountains of Tennessee. Definitely worth the visit if out that way. I grew up near the Pagoda, and got to see it as it was built. A lot of love and dedication went into the place, and continues there today... If you're ever in need of a good place or reason to relax and contemplate all that is not modern society, this is a boss way to do it. My husband and I and a good friend happened on the Peace Pagoda this afternoon on the way home from the Berkshire Bird Paradise. The Peace Pagoda is amazingly beautiful and serene. We were even given some beautiful Irises that were in need of a home. I wish we lived closer in order to participate in the daily services. Either way we will be back if only to sit by the beautiful lily pond and meditate. Thank you Jun Yasuda. Namaste. I want to thank Jun Yasuda for everything she has done & esp. for her friendship & influence to my son Andy who met her this past summer. This is how I became aware of this beautiful place & person. Fortunately he is an artist & wanted to paint the peace pagoda. Jun welcomed him & was very helpful so Andy had a very positive experience! Feeling more at peace & I am sure a changed artist I can't wait to see his paintings & to hear more about peace!! The Peace Pagoda in Grafton is transformative! The energy there is so peaceful and the place is beautiful. Just being there puts you in a meditative state. Jun Sun is truly a wonderful and evolved human being. I feel drawn to return and see how I can help. Jun San is an old friend and an inspiration to me in the truest sense, in that her spirit moves anyone open to her wisdom and non-violent response to the ills of the world. I urge folks to visit the pagoda and feel the peace that surrounds it and its wonderful nun, Jun San. Went there with my daughter Colleen. Truly an amazing and beautiful heart warming place. I met Jun San. A very congenial person. Went inside to see the Altar. It was an expierance i will never forget. she was on her way to N. Dakota to stand with the native tribe that is protesting the pipeline going thru their Sacred property.